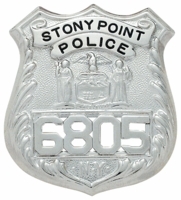 Choose from our wide selection of Law Enforcement and Security Badges. Expect a 2-3 week delivery. Today Smith & Warren is the most technologically advanced badge manufacturer in the United States. The finest materials are combined with cutting edge manufacturing technology to produce a product that can be worn with pride. Every Smith & Warren badge is manufactured within 3 Weeks and comes with a Full Lifetime Warranty. Smith & Warren badges are truly "Built to Last a Lifetime"
Please ensure accuracy before ordering. Custom Badges are final sale.